Inventor and entrepreneur John C. Koss is one of five individuals honored by the Society as a 2007 Wisconsin History Maker. The Wisconsin Historical Society celebrated the lifetime achievements of John C. Koss, along with four other individuals with Wisconsin ties, during the History Makers Gala in Milwaukee on May 9, 2007. Koss received the Seymour Cray Award for Distinction in Technology. Entrepreneur, innovator and creator of the very first stereophones, John C. Koss is the founder and chairman of Koss Corporation, a consumer electronics company recognized as the leading U.S. manufacturer of high-fidelity stereophones. 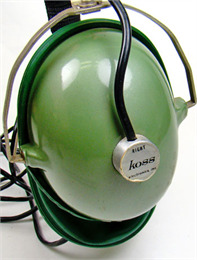 Koss stereophones introduced the concept of personal listening to the audio industry, forever changing the audio world. Koss was born on February 20, 1930, in Milwaukee, Wisconsin. He married in 1952, and using cash received as a wedding gift to buy the couple's first sofa, he founded the J.C. Koss Hospital Television Rental Company, which rented TVs to patients in Milwaukee hospitals. In 1958 Koss and engineer Martin Lange Jr. paired up to demonstrate a new audio device, "a little portable phonograph with side-wing speakers," at a Wisconsin audio show. It featured a "private switch," which allowed listeners to hear music by plugging in the world's first SP3 stereophone. The stereophones, originally just a gimmick to get buyers to appreciate the stereo sound of the portable player, became the hit of the show. Although headphones were not new, up to this point, they had been used for communication, not music. The Koss stereophones were the first to provide full range for both low and high notes. Milwaukeean John C. Koss founded Koss Corp. in 1953. In 1958 he introduced the world's first high-fidelity stereophone headphones, launching the personal listening industry. Koss went into business manufacturing and marketing stereophones in his basement in October 1958, finding eager customers nationwide. Koss eventually earned the endorsement of celebrities in the music industry like Tony Bennett, Les Brown and Mel Torme. Classical music lovers also appreciated the stereo effect of Koss' new stereophones, because the different signals in the right and left ears mimicked the concert hall. The Koss Corporation even garnered presidential recognition in 1969 when Pro-4 stereophones were installed on Air Force One during the Nixon Administration. A high school graduate turned entrepreneur, Koss' management hierarchy was simple, and Koss himself worked tirelessly to promote his product. In 1970 Koss Corporation headquarters moved into a larger facility in Milwaukee, where it's still located today. By the mid-1970s the company expanded internationally with a sales office in London, a marketing subsidiary in Canada, and manufacturing facilities in France, Germany, Italy and Ireland. Throughout his career, Koss has led the industry in innovation and research that emphasizes high quality, exciting listening and outstanding customer value. In 1982 the Medical College of Wisconsin, with an endowment from Koss, established the Koss Auditory Center for Research and Treatment. As compact discs revolutionized the audio world in the 1980s, Koss delivered one of the industry's first infrared stereophones. And in July 1989 Koss introduced its "No-Questions-Asked" Lifetime Limited Warranty Policy on its full line of stereophones, the first lifetime warranty of its kind in the industry. For his work, Koss has been recognized and presented with numerous awards. Most recently Koss was inducted into the International Consumer Electronics Hall of Fame in 2000 and into the Wisconsin Business Hall of Fame in 2004. To this day Koss remains actively involved in the Koss Corporation as chairman of the board. Koss and his wife Nancy have five children: Michael, Debra, John Jr., Linda, and Pamela, and 15 grandchildren.